Help End Second-Hand Sunscreen Application! It’s an addiction. It must be ended. Have interventions for our family and friends. It’s spray-on sunscreen, and it’s a killer. OK, maybe I’m being a wee bit melodramatic. I don’t know about you, but this supposedly way-easier-to-apply sunscreen needs to go. Think of it like cigarette smoke. Do you want to inhale second-hand smoke? Me neither. Ever wonder why most of the spray-on bottles say “Now 25% More!”? It’s because that extra 25% is getting sprayed into the atmosphere. We’re getting 25% more, but we aren’t going to use it. Everyone down-wind, however, should be ready for an unasked-for dowsing (or mouthful) of the spray. Just what I wanted in my nose. NOT! It hasn’t been that long since smokers had to take their second-hand smoke where it wouldn’t bother non-smokers. Most of them understand why, too. Next time you’re at the pool or beach, watch someone else apply the stuff. Then watch the spray waft into the air and choke the family sitting three chairs down. Watch how much has to be applied to get complete coverage. When we were on vacation, we watched people spray more sunscreen into the air than onto their skin. I admit that we’ve bought and used spray-on sunscreen. I won’t buy anymore of it though after my observations. I’ve tasted and inhaled enough of the stuff. Also, Consumer Reports published a report that we shouldn’t be using spray-on sunscreen on our kids anyway. And never spray it directly on a face (I saw a lot of that in Maui). The other day, I stopped a clueless dad (he even told his child that he didn’t know what he was doing) before he could spray his daughter’s face. He hesitated, and I took that as my cue to save them both (and me) from unnecessary sunscreen inhalation. I suggested that he spray it in his hands first. Maybe he wasn’t that clueless, because he admitted that he didn’t want to spray her face—he just didn’t know what to do. Here’s the Consumer Reports updated guide for finding the best sunscreen (sadly the summer is almost over though). By the way, the spray-on stuff is flammable, too. Eeek. Be considerate of others. If people are downwind, move somewhere else. No one wants his or her baby to breathe strange chemicals. Spray it into your hands and then apply it. Yes, I know this defeats the purpose of easy-application sunscreen. However, you’ll actually get to use the extra 25% that you paid for (nothing is “free”). 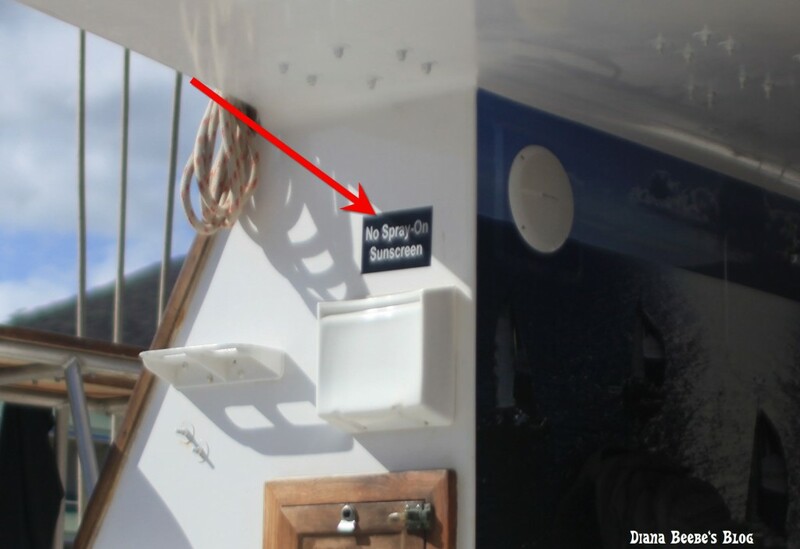 If there are signs posted that say not to use it, then don’t, especially on boats where people can’t move away from the cloud. Also, some sunscreens (spray-on and lotion) have oils and chemicals that harm coral reef systems. Teach your children how to apply it, if there isn’t another sunscreen available for them to use. They should spray it into their hands first. Is there a product that you have issues with because of the way people use it or misuse it? Do you get all “momma bearish” for other people’s children?